I’m super excited to hear about the trip especially because I’m going to NYC in 2 weeks and in the middle of making all of my plans now! Yummy lookin’ cookie! Good camera skills too what with the back lit subject and all! Welcome back. I too usually need a vaca after the vaca. Not anymore!!! Retirement is like one long vaca!!! ohh they’re so gorgeous! How creative! That cookie is so cute! Adorable! Sounds like a great trip! 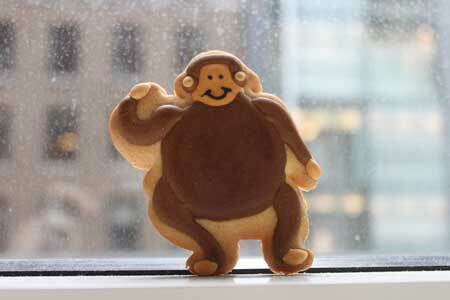 The monkey cookie is adorable! I can’t wait to hear the reviews. One of my daughter’s friends says the macaron at Bouchon are the best she’s had in the U.S. Hope to hear your take on them, as well as reports of the rest of your ‘research’ as well! Rest up first!! Welcome back! I can’t wait to hear more!